The reasons that I loved reading V for Vendetta are probably the same reasons that it’s had such wide appeal in the publishing market. Exploring themes of powerlessness and injustice, this graphic novel tries to offer the reader some resolution, at least in its imaginary world; it makes concrete some of our most deeply-rooted fears. For example, the fact that certain groups are put into camps makes concrete a danger that is based in reality. This was a fear that turned into fact for many over the last hundred years; in the twentieth century, the years sometimes referred to as the “century of genocide,” concentration, death, and work camps had been a historical fact. Originally published in England in the 80s, V for Vendetta also made real other fears such as those that arose in England when A.I.D.S. became an epidemic. There was an ever increasing panic about the virus, which fueled intolerance and blame. 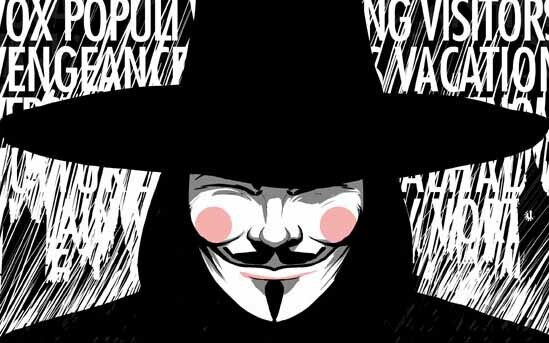 It was in this climate that V for Vendetta was released and gave the reader some vindication from a troubling world. Another reason for the appeal of V for Vendetta is its general comments on and questions about humanity. Similar to great works of literature, V for Vendetta addresses questions such as: what are the things that can make us lose our integrity, how far will we go to get and maintain power, what will we do when we see our brothers and sisters in humanity suffering, how far will we go to pursue justice, how does power corrupt, and how are the powerful shielded from the laws that apply to the rest of us? “I shall die here. Every inch of me shall perish. Except one. An inch. It’s small and it’s fragile and it’s the only thing in the world that’s worth having. We must never lose it, or sell it, or give it away. We must never let them take it from us” (Alan Moore, V for Vendetta, 159-160). So, even if you have seen V for Vendetta, the major-motion picture released by Warner Brothers a few years back, I would definitely recommend reading the graphic novel because it explores, in greater depth, significant questions that continue to be part of the human condition. It will make you question the world around you and your own place in it. Posted on January 30, 2015 by Writer. This entry was posted in Review and tagged Alan Moore, Graphic Novel, V for Vendetta. Bookmark the permalink.